New Delhi, June 14: Addressing the Muslim gatherings on the occasion of ‘Roja Iftar’ organised by Muslim Rashtriya Manch (MRM) activists across the country, Indresh Kumar, Patron of the MRM and senior RSS functionary reiterated that the Muslim Rashtriya Manch has been busy since its inception in 2002 to maintain the communal harmony in the country. 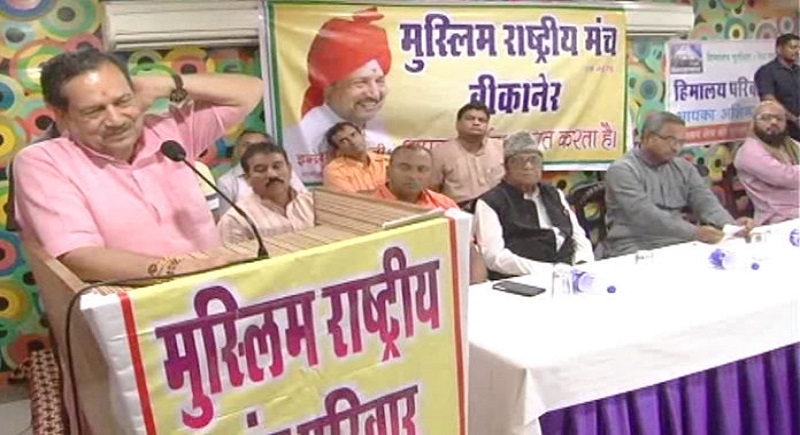 The program held at Bikaner in Rajasthan was attended by Union Minister Arjun Ram Meghwal, MLA Dr Gopal Joshi, Mayor Narayan Chopada, MRM National Convener Abu Bakar Naqvi, Regional Convener Ayub Kayamkhani, Maulana Firoz Ahmad Kadri and others. Indresh Kumar said that in the holy month of Ramjan, the MRM disseminated the message of communal harmony, education, progress and social homogeneity to the Muslim community. He appealed to the people present there to follow one’s religion and respect the religion of the others. He told the gathering about the social activities of the Muslim Rashtriya Manch and said that ‘Anaj Bank’ project is being run in five states. Besides, the MRM is concentrating on education of Muslim children through the ‘Shahid Ashfaqullah Khan Memorial Trust’. He appealed to the Muslim to use ‘zakat’ for the welfare of women and children. He said that the MRM has launched a non-government pension scheme for ‘talaq-affected Muslim women with the help of donors. The intention is to make them self-reliant and independent. Taking a dig at Rahul Gandhi’s visits to temples, Indresh Kumar described this as ‘Rahul Gandhi’s drama. How suddenly he remembers temples?, he asked. He asked the Congress and other party leaders to learn from the RSS. Terming Pakistan as terrorist country, Indresh Kumar said that India has been a peace loving country. He appealed to all political parties including Congress not to play divisive politics for their petty political interests. Instead they should serve the nation and its people honestly and keep the country united, he said. Addressing another Iftar Party held at Masjid-Umm-Ul-Madaris at Ludhiana in Punjab Indresh Kumar said Babur, or Aurangzeb cannot be the heroes of Indian Muslims. They came here as invaders and plundered and looted our motherland. On the other hand, personalities like former President Dr APJ Abdul Kalam, Shahid Ashfaq ulah Khan, Hasan Khan Mewati, Begum Hazrat Mahal, Colonel Nizamuddin are the heroes of Indian Muslims. He called upon the Muslims to become a true follower of their religion and not a fundamentalist.